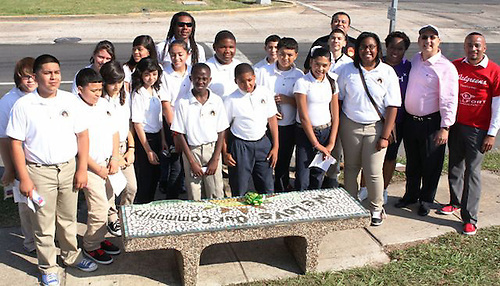 The project represents a collaborative effort between METRO, the Bellfort Gardens civic leader group, the Museum of Cultural Arts Houston (MOCAH), the Mayor’s office and, of course, the students themselves. Steven Cooper, Bellfort Gardens leader, wanted to involve the students with this beautification project as a means of introducing them to the idea of taking civic responsibility and ownership of their neighborhood. Attendee Gilbert Garcia, the Chairman of the METRO Board of Directors, encouraged the students to never stop achieving and told them that, with hard work, dedication, and a willingness to pursue their goals, they could someday take a place on the Metro Board of Directors. The installation of this bench may prove to be the first of many more to come, as Bellfort Gardens hopes to continue this civic beautification project, working with METRO, MOCAH and Hartman to create and decorate seven more benches along Bellfort Avenue.